Quetzalcoaltl, Feathered serpent, Teotihuacan, precolumbian reproductions, mesoamerican reproductions. Pyramid of Quetzalcoaltl, Teotihuacan, Mexico. 300 A.D.
One of the great Gods of Ancient Mesoamerica, Quetzalcoatl is a synthesis of serpent and bird. The name means "quetzal serpent". The quetzal was a sacred bird of very beautiful feathers which were used in elite and ritual costumes. Quetzalcoatl, the patron of rulership, had several incarnations, the most important were as a creator god, as Ehecatl, the God of Wind; as the Morning Star; and asTopiltzin, a semi-human ruler, unique among the Gods. The priestly Quetzalcoatl was often contrasted to his dark shamanic brother Tezcatlipoca, the God of war, and their relation veer between enmity and alliance. 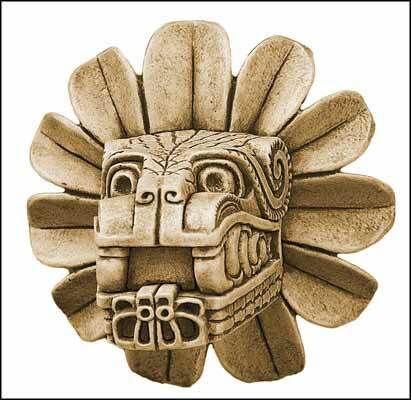 According to Aztec and Maya creation accounts, after the great floods ended the era of the Fourth Sun, Quetzalcoatl and Tezcatlipoca raised the heavens and create the Earth. Since no people inhabitated the earth, Quetzalcoatl descended to the underworld to retrieve the remains of the people destroyed by the flood. Their bones were ground like corn into a fine meal and upon it the gods let their blood, thus creating the flesh of the present race and the era of the Fifth Sun.